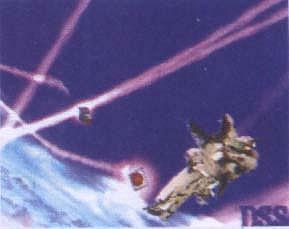 Here are the first exclusive screen shots of the upcoming Japanese Macross Plus game for the Playstation by Shoeisha. I have been able to determine that this game will have two modes of play. 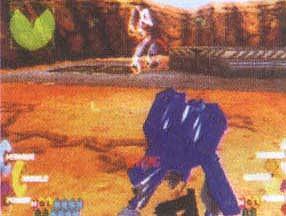 The first is Story Mode, which is a single player mode and closely follows the story of the OVA. The second mode is Free Play, which will allow for one or two player battles. 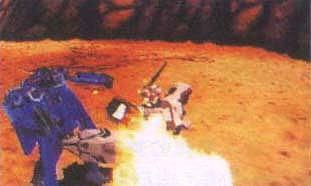 In Free Play mode, players will be able to choose both older Valkyrie designs and Zentradi mecha as well as well as the mecha from Macross Plus. I am not sure yet whether it will be possible to run two player battles on a single Playstation or if it will be necessary to have two Playstations and a link cable. The game will feature original music from Macross Plus including Sharon Apple's songs. Also cut scenes from the OVA will be featured. The Story mode has something called Digital Situation System (DSS), which apparently is some sort of cut scene showing Valkyrie transformations. 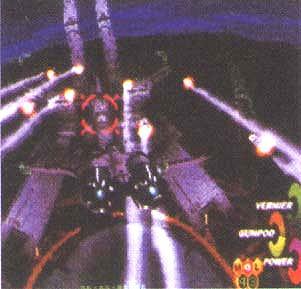 To me the graphics look as good or better than VF-X2. However, pretty graphics do not a good game make! As usual with this type of game it will be the gameplay that makes or breaks it. Unfortunately, there is still no confirmed release date or price for this game. 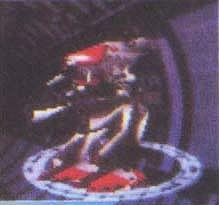 That's all for now folks and sorry the scans are so bad, but they were scanned from really small pics.